::(Welcome to Island Pearl Holidays, Maldives - Ellaidhoo Tourist Resort Maldives - Ellaidhoo is a small coral island with a total land area of 55,625 square metres. 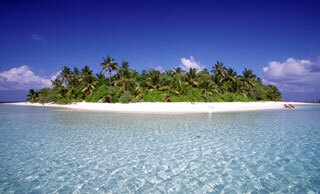 The island is 300 metres long and 280 metres wide, and is covered by thick tropical vegetation. The total built up area of the island is only 7,060 square metres (12.7% of the total land area). 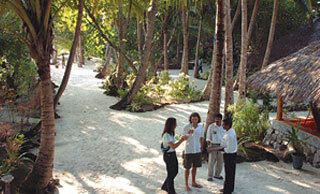 The magnificent house reef just 20 metres away from the beach surrounding the island, is the hallmark of the resort. Garden Bungalows: backof the individual beach bungalow built in year 2000, with Air-Conditioning, IDD Telephone, Mini Bar, Hair Dryer, Cable TV, and Terrace and attached open bath room with fresh hot and cold running water. Superior Rooms: Two storey rooms (four rooms in a block) built in 1998, with air-conditioning, mini-bar, IDD telephone, terrace, cable TV and attached open bath room with fresh hot and cold running water, bath Tub & Hair Dryer. Beach Bungalows: Individual beach bungalows refurbished in 2000, with air-conditioning, mini-bar, IDD telephone, Cable TV, Terrace and attached open bath room with fresh hot and cold running water, bath tub & Hair Dryer. 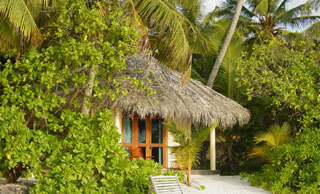 The Food and Beverage outlets on Ellaidhoo offer a variety of local and international dishes. MAIN RESTAURANT: The main restaurant is open at fixed times and serves in buffet breakfasts, lunch and buffet dinner. COFFEE SHOP: The coffee shop with Internet is open from 9am in the morning until midnight and serves different hot and cold beverages, snacks, and various local and international dishes. Internet service is also available here at set times during the day. MAIN BAR: The main bar is open throughout the day from seven in the morning until the last guest leaves at night. A variety of exotic cocktails and alcoholic and non-alcoholic beverages are available. Disco, Live Music, Inhouse Movies, Souvenier Shop, Gym Work out, Aerobics, Complimentary Spinning Sauna & Jacuzzi, Billiards, Squash, Tennis, Table Soccer. Scuba Diving, Boutique/Shop,Asia massage treatments with rejuvenating oils and herbs, football, volleyball, badminton or table tennis, Island Hopping, Visit Hangnameedhoo, Snorkeling Trip, Snorkelling Safari, Sunset Fishing, Night Fishing, Morning Fishing.